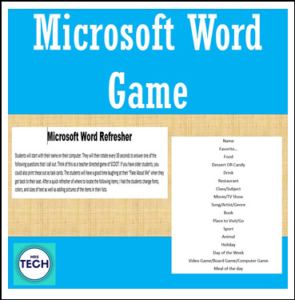 This is an activity that I used in my Elementary Tech classes to refresh what we learned last year about Microsoft Word basics. Directions: Students will start with their name on their computer. They will then rotate every 30 seconds to answer one of the following questions that I call out. Think of this as a teacher directed game of SCOOT. If you have older students, you could also print these out as task cards. The students will have a good time laughing at their “Fake About Me” when they get back to their seat. After a quick refresher of where to locate the following items, I had the students change fonts, colors, and sizes of text as well as adding pictures of the items in their lists.